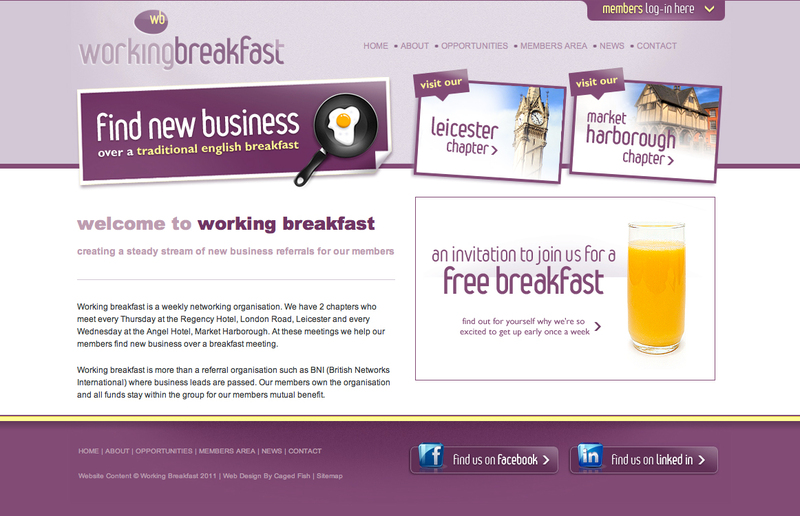 Full Fat Designs joined the Leicester Chapter of Working Breakfast after accepting a free invitation to join other business's over a traditional english breakfast. After discussing work during the initial 'open networking', it was down to breakfast and finding out what everyone did during 60 second adverts and how referrals could be passed depending on what people were asking for. After seeing how many referrals were passed, and generally how everyone was keen to help each other, we decided to join. The fact there was no pressure either was a good sign that this was a friendly, professional group of people. Full Fat Designs has now been a member for 10 weeks and the amount of suggested contacts and business passed to me has helped secure new business, especially since our turn at giving a 10 minute talk, where I was able to show what Full Fat Designs are capable of. 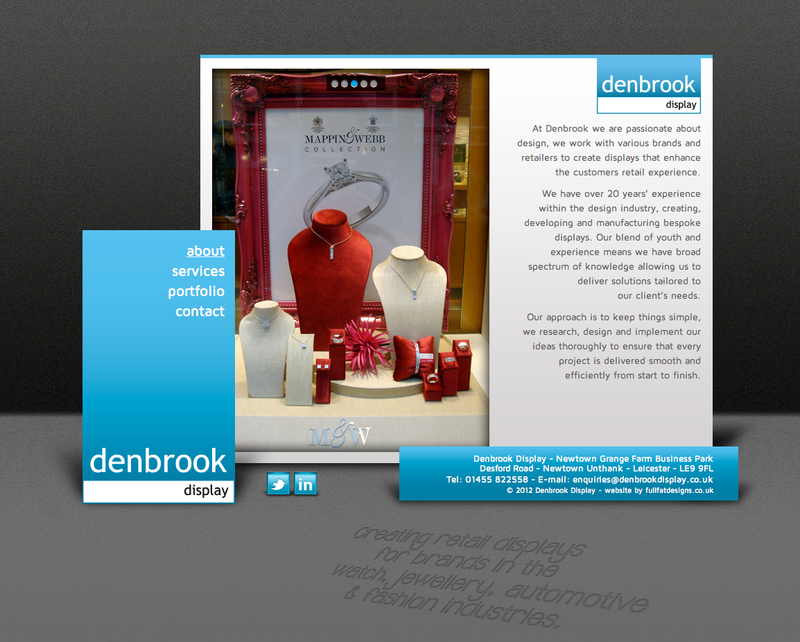 Denbrook Display from Leicester came to Full Fat Designs needing a compact website to showcase their designs and built displays. They currently had a holding page which had remained the same for some time and they realised that they needed a site to backup their well designed and built displays when talking to potential clients. After an initial chat with them, we decided to design the site as though they were self standing boards at different positions, which with shadows and lighting gives the website depth. Denbrook are passionate about design, working with various brands and retailers to create displays that enhance the customers retail experience. They have over 20 years’ experience within the design industry, creating, developing and manufacturing bespoke displays. The blend of youth and experience means they have broad spectrum of knowledge allowing them to deliver solutions tailored to the client’s needs. Their approach is to keep things simple, through research, design and implementing ideas thoroughly to ensure that every project is delivered smooth and efficiently from start to finish. 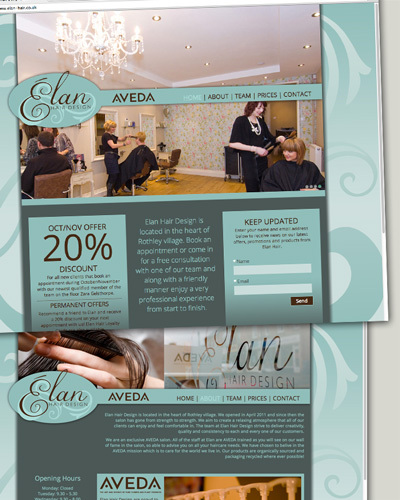 Elan Hair Design is located in the heart of Rothley village and were after a website to promote their salon. They are an exclusive Aveda products salon, and wanted to feature this quite prominently as their products are high quality. The team and salon were professional photographed to give the website a professional look. Elan Hair Design is located in the heart of Rothley village. We opened in April 2011 and since then the salon has gone from strength to strength. We aim to create a relaxing atmosphere that all of our clients can enjoy and feel comfortable in. The team at Elan Hair Design strive to deliver creativity, quality and consistency to each and every one of our customers. We are an exclusive AVEDA salon. All of the staff at Elan are AVEDA trained as you will see on our wall of fame in the salon, so able to advise you on all your haircare needs. We have chosen to belive in the AVEDA mission which is to care for the world we live in. Our products are organically sourced and packaging recycled where ever possible! 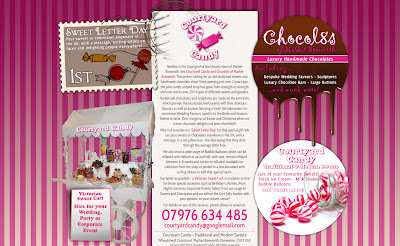 www.sweetletterday.co.uk is the first website to branch off from the www.courtyardcandy.co.uk website offering that special gift! Great for birthdays, anniversaries, celebrations, 'sorrys' etc. 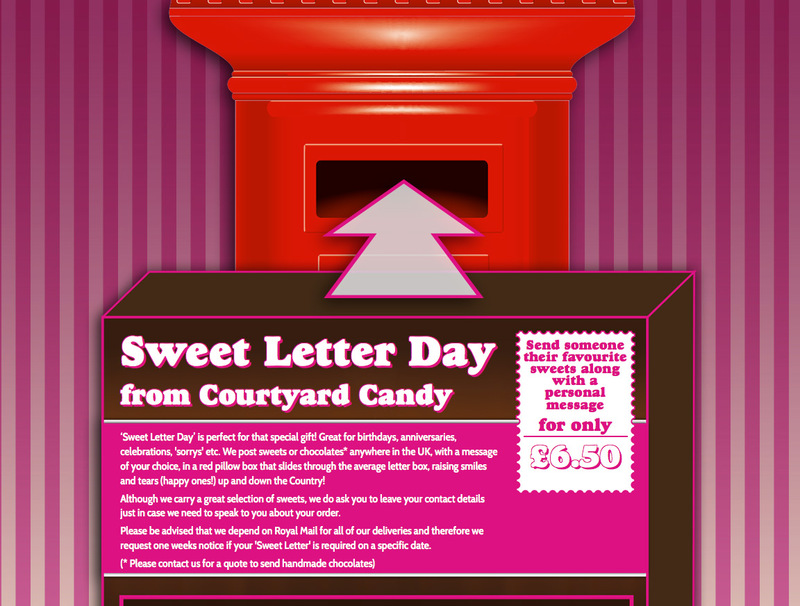 They post sweets or chocolates anywhere in the UK, with a message of your choice, in a red pillow box that slides through the average letter box, raising smiles and tears (happy ones!) up and down the Country! 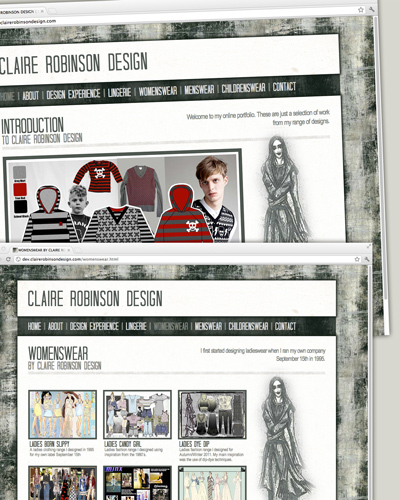 Claire Robinson is a Freelance Fashion Designer from Leicester and she contacted Full Fat Designs to design and build a portfolio website to showcase her work and ideas. The website also needed to feature her design history and experience to show potential clients her successful years in the industry. The pages were designed and built with a view to letting her Claires work stand out, so although a heavy background is used, the designs stand out brightly on the white plaster backing. 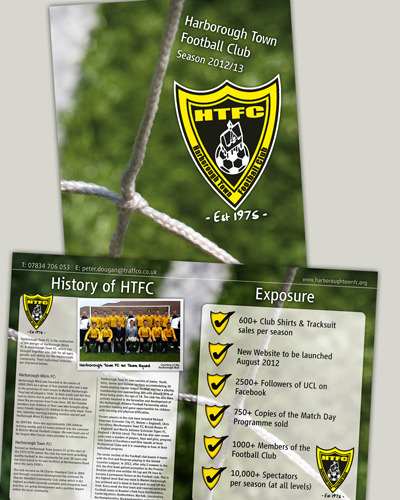 The recently promoted Harborough Town Football Club needed a small booklet to show potential sponsors key benefits of what their money would offer them. As they had made the step up, the design and print had to do the same. Full Fat Designs produced an 8-page brochure that was inspiring to look at, clearly laid out and had a quality feel to the print to whoever held it. The finished item was well received and we are currently looking at applying the same results to their matchday programmes. Harborough Minis was founded in the winter of 2000/2001 by a group of four parents who saw a gap in the provision of mini soccer in Market Harborough. They had all played a ‘little’ in their youth and felt they had no choice but to pull back on their old boots and show the youngsters how it was done. All the founder members had children of their own who brought along some friends (approx 15 children in the early days). From this, Saturday morning training sessions started and Harborough Minis FC was born. By 2007/08, there was approximately 180 children training weekly and 13 teams entered into the Leicester & District Mutual Football League. 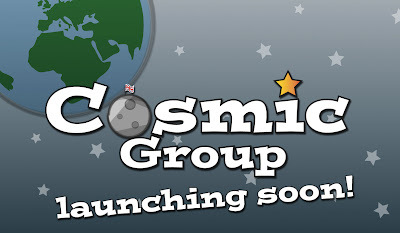 We now boast one of the largest Mini Soccer clubs provider in Leicestershire. Formed as Harborough Town Juniors FC at the start of the 1975/1976 season the club has now been providing quality football in the community for over 30 years and has been based in its own facilities at Northampton Road since the early 1990’s. The club became an FA Charter Standard Club in 2004 and through consistent development has achieved FA Charter Standard Community Club status which is the highest accolade currently available and recognises best practice, on-going development and a positive impact within the local community. Harborough Town FC now consists of Junior, Youth, Girls, Senior and Veteran sections accommodating 20 teams playing regular league football and has a playing membership now approaching 300 with around 90% of those being under the age of 18. The club has also been actively involved in the formation and development of the Harborough Alliance Football Partnership which provides training and game opportunities for children with learning and physical difficulties. Former players at the club have included Richard Stearman (Leicester City FC, Wolves + England), Chris Carruthers (Northampton Town FC, Bristol Rovers FC + England) and Martin Johnson (Leicester Tigers FC, England + British Lions). The club has also over recent years seen a number of players, boys and girls, progress into Centre of Excellence and Elite squads at local Professional Clubs and it is rewarding to hear of their individual progress. The senior section of the Football club boasts 4 teams with the first and Reserves playing in the United Counties Leagues. In 2012, after only 2 seasons in the UCL the first team gained promotion to the Premier Division which now entitles FA Cup and FA Vase to become a permanent fixture at the Football club. This is the highest level that any team in Market Harborough has achieved and is down to hard work on and off the field. Every week the first team and reserves entertain Football teams at Bowden’s Park from Hertfordshire, Cambridgeshire, Bedfordshire, Norfolk, Lincolnshire, Northamptonshire, Buckinghamshire and Leicestershire. 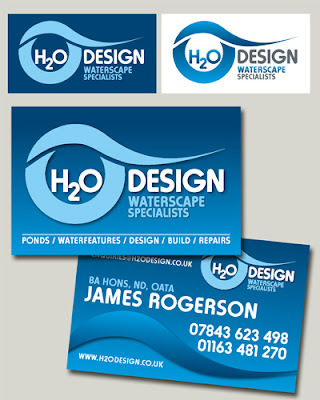 H2O Design came to Full Fat Designs needing a logo and business card producing quite quickly, as existing business cards were nearly out and a new look was needed. 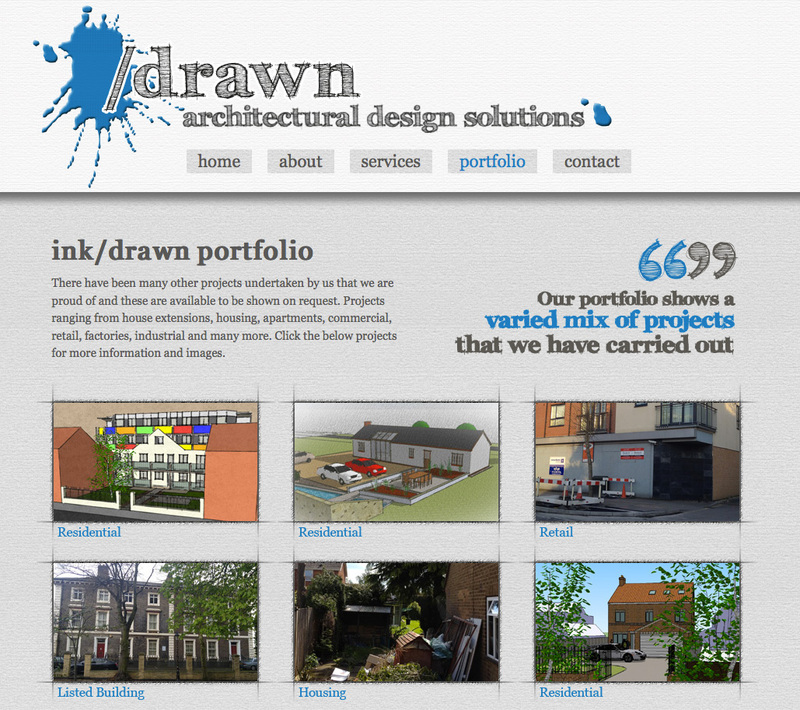 Four strong ideas were presented to the client and after a few tweaks the final design was signed off. 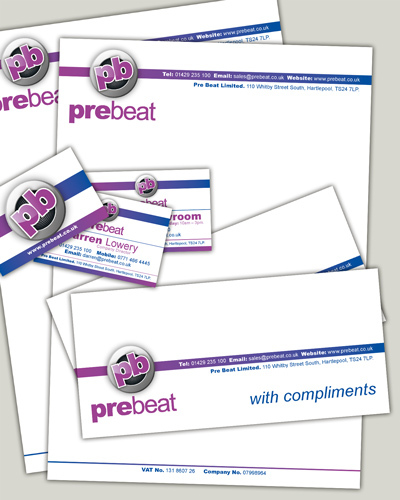 Double-sided business cards were designed and printed after the logo was agreed. One side acting as an eye-catching advert when the cards were left at garden centre counters, while the other side gave all the details needed for an enquiry. With the addition of matt laminate, the business cards give off a real quality. 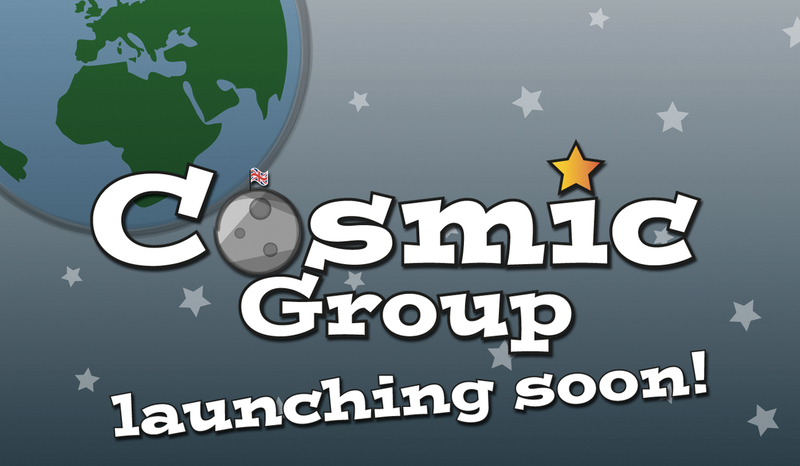 Since the ink/drawn holding page went up, Full Fat Designs have been working away the the main site. The design was created and approved very smoothly as we had a feel for the look the client was after during the initial stages of creating the holding page. 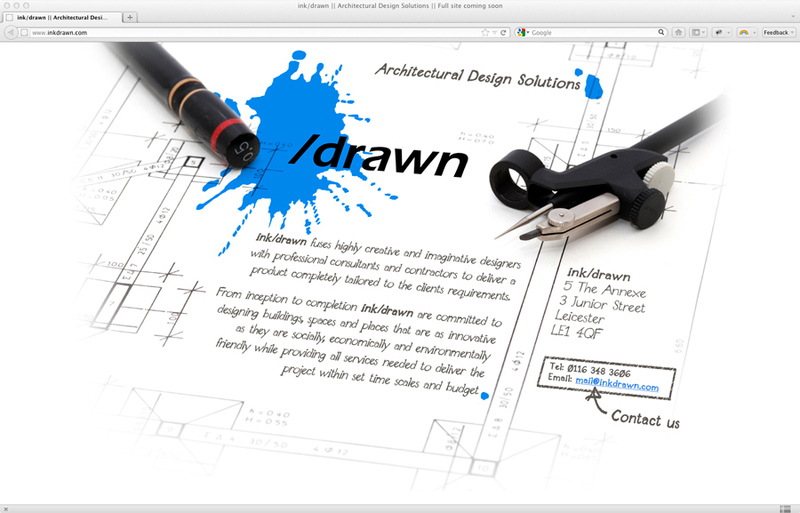 The site wanted to look professional, but with a hand drawn element to help create a link to the name. Pencil and pen markings along with a graphic pen style font on a textured paper background helped to create this look. Does your company need a temporary holding page? This solution is perfect when you haven't quite got everything in place to have a full site built. Whether it's because you are too busy, or just not sure what you want to say or put on your site, a holding page shows your company still wants a web presence. ink/drawn came to Full Fat Designs in need of something quickly, as business cards had been created and given out with www.inkdrawn.com on them and people were greeted with a 123-reg welcome screen - not the best first impression. A design was agreed and the holding page was up in no time, the client happy and now with that off his mind, could concentrate on what to put on the main... coming soon! Professional Integrity recently contacted Full Fat Designs for their Branding Start-up Package. For £270 you get a bespoke logo design (several initial ideas narrowed down to your preferred choice), Stationery design to suit your new logo. 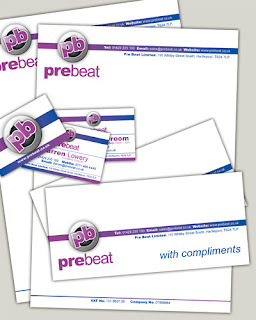 Then printed to quantities of 500 Business Cards (double-sided with matt or gloss laminate), 500 Letterheads and 500 With Compliements Slips, all delivered to your chosen address. The package isn't just for start-up companies, Professional Integrity have been trading for several years, but realised they needed a new look and the Branding Start-up Package was perfect. 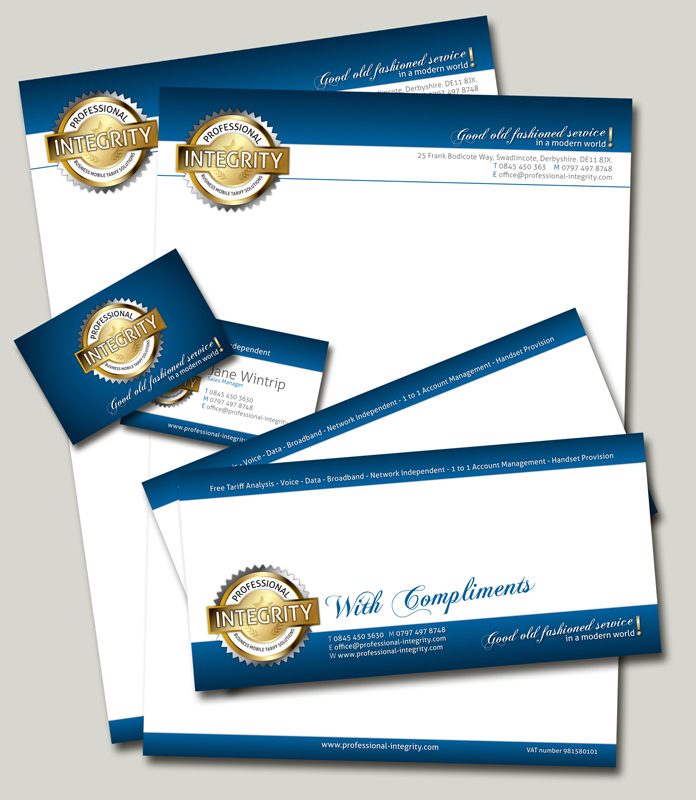 They are delighted with the results, both on the quality of design supplied and the print afterwards. Would the package be ideal for your company too? Give Full Fat Designs a call on 01455 822208 to find out, or visit www.fullfatdesigns.co.uk to see more information on this and other services offered, including the partnering Digital Start-up Package for only £320. 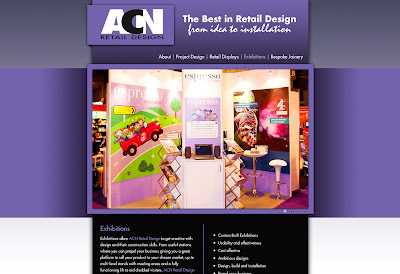 Start of the year and the start of a new site for ACN Retail Design built by fullfatdesigns.co.uk. 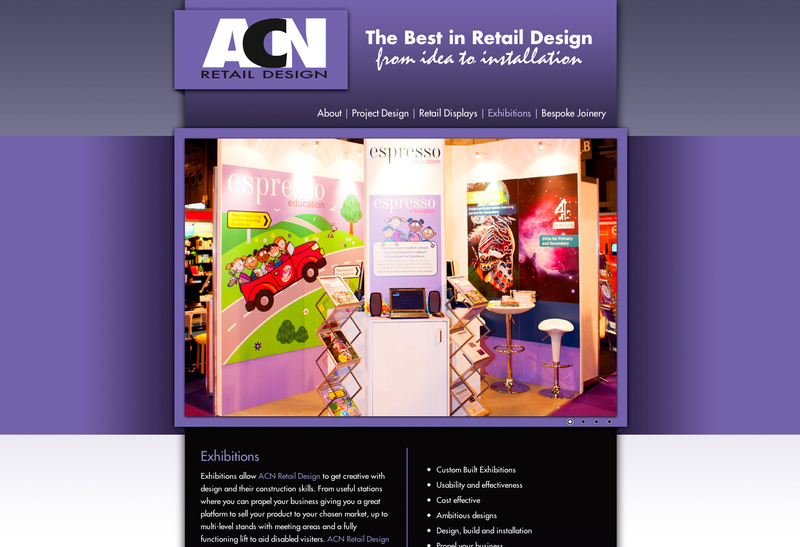 Based in Broughton Astley, Leicestershire, ACN Retail Design provides the best in Retail Designs, Point of Sale (POS) and Shop Fitting for domestic or commercial clients throughout the UK. Their site needed to be a visual, functional site which they will also be able to edit themselves in the very near future, ensuring all their visiters are seeing up-to-date work.